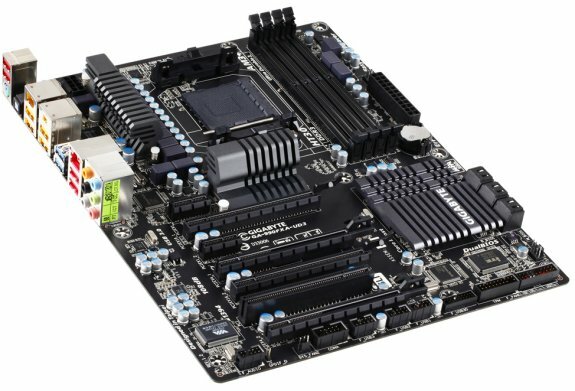 Gigabyte introduced the 990FXA-UD3 1.2, a new $160 motherboard for AMD's upcoming FX processors. Full details at TechPowerUp. The board is based on the AMD 990FX + SB950 chipset, and supports the upcoming AMD FX processors apart from socket AM3 processors in the Phenom II and Athlon II series. As a new revision, the board supports AMD FX processors out of the box. The AM3+ socket is powered by an 8+2 phase VRM. The board is constructed according to the UltraDurable 3 Classic specifications, with 2 oz copper-layer PCB, 50,000+ hours capacitor durability, and DualBIOS. The socket is wired to four DDR3 DIMM slots supporting dual-channel DDR3-2000 MHz memory with overclocking. There are four PCI-Express x16 slots on this board, however, only two of them are wired to the AMD 990FX northbridge, both run at full PCI-Express 2.0 x16 bandwidth at all times. The other two are electrical PCI-Express x4, wired to the SB950 southbridge. The board supports both NVIDIA SLI and AMD CrossFireX, though it's likely that it will ship with just the 2-way SLI bridge cable.